It is imperative that one takes the relevant steps to keep fit – after all, we only have one life, and if we are not going to love our own bodies, then who would? This would mean getting enough exercise, not to mention the right kind that suits our bodies. The thing is, some of us do happen to have joints that aren’t up to par, and indulging in high impact sports or activities aren’t too good for the knees, which is why activities such as swimming and cycling would be more appropriate. Perhaps the $999.95 Elliptical Bicycle might be worth checking out then. The Elliptical Bicycle is a special bicycle that is propelled by elliptical exercise movements, where it will then be able to deliver a full-body, low-impact workout while you are enjoying the outdoors, making it a whole lot more fun as opposed to riding on a stationary exercise bicycle. 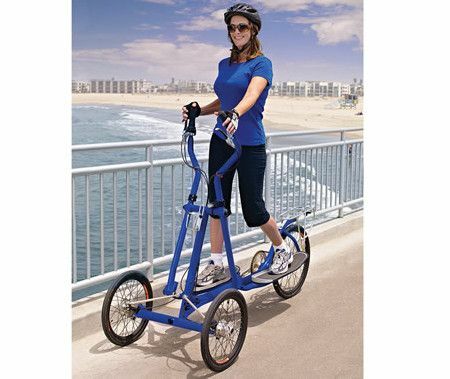 It will boast of upright handlebars and foot platforms that will move back-and-forth, helping build muscles and providing cardiovascular exercise while propelling the three-wheeled bike forward. Muscles in the arms, back, and legs will be toned through low-impact exercise which is easy on the knees, hips, and shoulders. Expect its patented steering system to allow riders to turn by leaning to one side, which is also a movement that exercises core muscles, now how about that?